In Hear This, The A.V. Club writers sing the praises of songs they know well. This week: Songs we discovered in video games. Although there’s been great music in gaming for many years now, designers have only recently started to understand how to use their soundtracks—especially, licensed tracks from mainstream artists—to perfectly underscore their players’ actions. Grand Theft Auto made big steps forward with its radio stations, full as they were with recognizable hits. But one of the leading innovators in the video game soundtrack is a series once dismissed as little more than an “urban-themed” ripoff of Rockstar’s long-running franchise: Saints Row. The open-world mayhem of Saints Row didn’t come into its own, musically and otherwise, until its third iteration. It’s the first game in the series that’s just straight-out bonkers, for one thing; the sort of entry that scores a chainsaw-filled luchadore battle with Joe Esposito’s brilliantly cheesy “You’re The Best Around,” or slowly fades in Bonnie Tyler’s “Holding Out For A Hero” as the player drives to save their fellow gang members in one of the games’ big climaxes. But it’s much earlier that Saints Row: The Third lays out its stylish bona fides in full. 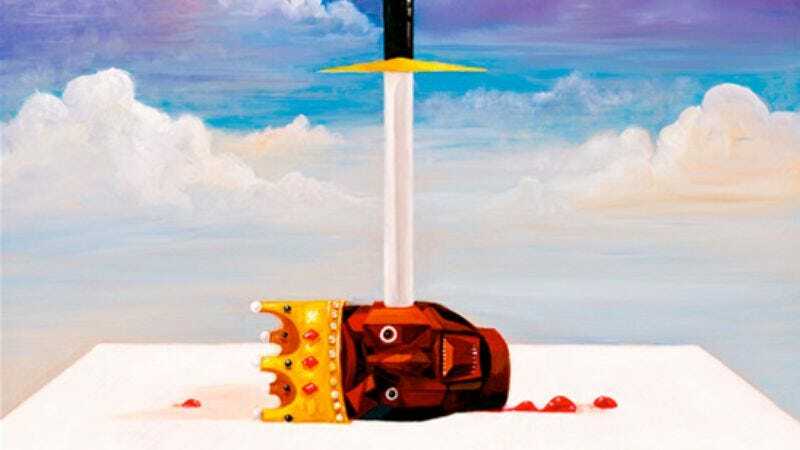 Kanye West’s “Power” is a masterpiece: arrogant, melancholy, and irresistibly bold, it’s the stand-out track on his My Beautiful Dark Twisted Fantasy, an album that doesn’t lack for ear-catching work. Saints Row: The Third used the song in its promotional trailers and in-game radio stations, but it wasn’t until the mission “Party Time” that the game showed off how effective West’s self-aggrandizing anthem could be as the background for gleeful, over-the-top chaos. The mission opens with the player’s character—an unnamed, creatively violent brute known only as The Boss—hovering in a helicopter over an unsuspecting penthouse party. The goal: To parachute in, kill pretty much everybody, and seize the place for themselves. It all seems straightforward—maybe even a little rote, given that this was a video game published in 2011—until the mission proper starts. That’s when those opening vocals kick in, the “Oo-ohs” and “Aa-ays” that tell you things are about to get awesome. If you’ve got any sense of rhythm (and know the song, obviously), you’ll wait in the helicopter for a moment, biding your time, and then, just as West’s voice breaks in, tap the jump button, and leap into the fray. It works. God, does it work, as you blast your way through hordes of henchman while West declares himself his own 21st-century superhero. The song infuses the fight with energy, underlining the gleeful violence as you rush from floor to floor, body slamming enemies and blasting away at waves of interchangeable thugs. West’s brio adds an already-kinetic game a feeling of vitality it’ll never match again, and it somehow does it despite the game’s message running completely counter to the song’s. Because for all its bombastic bragging, “Power” is a song that’s deeply skeptical of its subject matter. West subtly changes the title line to “Powder” as the refrains progress, ending with him contemplating throwing himself out a window—no video game-friendly parachute attached—to grant himself a “beautiful death.” Saints Row has no such melancholy pretensions; it’s first and foremost a game about doing whatever you want, in as crazy and dangerous a way as you can possibly conceive. It’s “Power” in the purest, most aggressive sense, and it grabs the energetic heart of West’s song and bends it to its wacky, consequence-ignoring will.